We know how big it is here for Hawaii's graduates and graduation. And it calls for a celebration. You have the celebrant we have the perfect party bus graduation transportation. 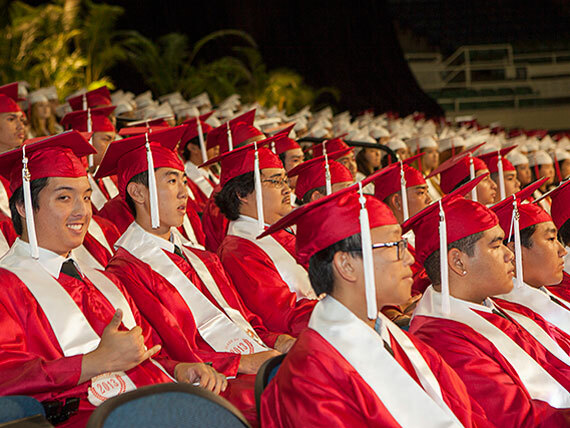 Celebrate differently when you, your family, and friends lei the Hawaii graduate! Surprise your graduate with a surprise party in our luxury party bus after the graduation ceremony at Aloha Stadium, Neil Blaisdell Center, or at their respective school. You don't need to fight the Hawaii traffic and worry about parking, we'll pick you all up and you all can go straight to celebrating! Or book a Hawaii party bus for your graduates party on a night on the town to celebrate differently. Call us at (808) 725-3028 to inquire and book an Oahu party bus for your graduate.